Broken garage door springs can cause serious injury if not handled properly with the appropriate tools. Rather than risk personal injury, why not trust your garage door spring repair Moorpark CA to the professionals? At Carroll Garage Doors, we know how to get the job done right. Call us and you won’t have to worry about injury or property damage. 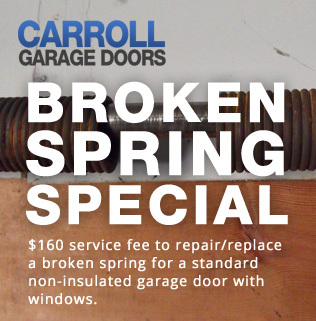 We even offer promotional rates and coupons for garage door spring repair from time to time. Broken Garage door spring repair range from an inconvenience to a serious problem that can potentially ruin your door. Trying to raise or lower a garage door on a broken spring can burn out your garage door opener motor and potentially damage other parts of your garage door system. You might even find that your garage door spring problems have made it impossible to open the garage door. Don’t let a broken spring trap your car in the garage. You can greatly reduce your risks of a spring breaking on you by getting regular inspections from Carroll Garage Doors. An annual inspection will greatly improve your chances of identifying and replacing worn springs before they snap. Inspections are a great way to protect your investment in your garage door and garage door opener system.